Borussia Dortmund will be hoping the DFB-Pokal provides some welcome relief from their Bundesliga woes. Dortmund travel to 2.Bundesliga club St Pauli in the second round on Tuesday amid a six-game winless streak in Germany’s top flight that has left them languishing just a point above the relegation play-off spot. Jurgen Klopp’s side tasted defeat for the fourth game in succession after slumping to a 1-0 defeat at home to Hannover 96 on Saturday. Dortmund are at a loss to explain their worrying league slump but the 2012 champions – finalists last season – will be looking to the UEFA Champions League for inspiration, having won all three group games to date. 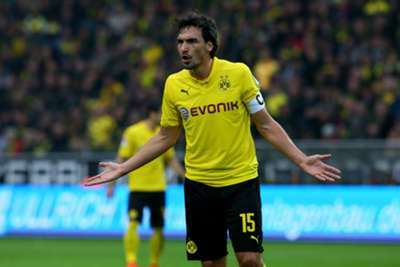 “It’s becoming difficult to find an explanation [for our poor form],” said Dortmund captain Mats Hummels. “It’s no use talking about an undeserved defeat against Hannover, that won’t get us anywhere. We had many, many chances to make it 1-0, but we didn’t manage to do that. Bundesliga teams Werder Bremen, Hertha Berlin, Hannover 96 and Cologne are also in action on Tuesday. Six-time champions Bremen are away to third-tier club Chemnitzer FC, 3.Bundesliga leaders Arminia Bielefeld play host to Hertha, Hannover face second division outfit Aalen, while Cologne go head-to-head with MSV Duisburg. On Wednesday, defending champions Bayern Munich face Bundesliga rivals Hamburg at Imtech Arena. Bayern – three points clear at the league summit – have been impeccable this season after losing to Dortmund in August’s German Super Cup. Pep Guardiola’s Bayern have not lost their 12 competitive games since, and have scored a whopping 17 goals in the past three matches. Alarming for Hamburg is the fact that they have failed to win any of their past five games on home soil. Elsewhere on Wednesday, Bayer Leverkusen – cup winners in 1993 – travel to Magdeburg. Wurzburger Kickers host Eintracht Braunschweig, Freiburg visit 1860 Munich and Hoffenheim play FSV Frankfurt. RB Leipzig tackle Erzgebirge Aue for a place in the third round, Wolfsburg are at home to Heidenheim, while Borussia Monchengladbach make the trek to Eintracht Frankfurt in an all-Bundesliga affair.